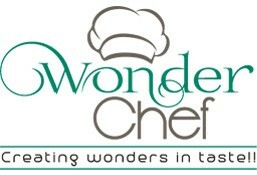 Wonder Chef is currently closed for delivery and it will open at . Any 2 Veg Dish, Dal Tadka/Dal Fry/Dal Makhani, 2 Tandoori Roti/1 Garlic Butter Naan/2 Roomali Roti/3 Tawa Chapati, Jeera Rice, Salad, Raita, Papad, Pickle. Any 2 Fish/Prawns Dish, Dal Tadka/Dal Fry/Dal Makhani, 2 Tandoori Roti/1 Garlic Butter Naan/2 Roomali Roti/3 Tawa Chapati, Jeera Rice, Salad, Raita, Papad, Pickle. 2 Idlis/2 Wadas/1 Idli & 1 Wada, Sambhar, Rasam, Plain Rice, Coconut Chutney, Red Chutney, Fried Papad, Pickle. Any 2 dishes, 2 Tandoori Roti/2 Malabar Parotta, Sambhar, Rasam, Plain Rice, Coconut Chutney, Red Chutney, Fried Papad, Pickle. It Served with "Qorma Gravy"